Christmas – The Same Old Thing? Most of the time when someone makes a comment that misses the mark as it relates to our age, it misses the mark on the ‘low’ side. Whereupon, we might dutifully interject a correction—except on those occasions when we decide to just ignore it, because it feels so-o-o much better that way. Assuming it’s one of those days when our commitment to truth trumps our vanity, and we make the appropriate adjustment, they are prone to adopt a look of shocked dismay at their error in judgment. Their eyes and mouth may fly open in a manner analogous to having encountered a liberal politician telling the truth. “No…!” they may exclaim, and then proceed to initiate a detailed inquisition in search of the specific factors that may have contributed to our flagrant and ridiculous refusal to participate in the normal aging process. They are likely to be deeply interested in such things as our diet, which gym we belong to, how often we work out, our medical history, family background, choice of nutritional supplements, spiritual gift patterns, and whether we sleep crossways in the bed on nights when there’s a full moon. Age, apparently, has some serious implications. A couple of weeks ago, in the midst of a conversation that really had nothing to do with anyone’s age, the subject randomly found its way into the exchange. My friend stopped almost in mid-sentence, looked at me, and just sort of blurted out, “Well… how old are are you, anyway?” I thought it somewhat unusual, but told him my age. He sort of cocked his head to one side as though deep in thought, paused a moment, and then proceeded to inform me that he had been convinced that I was nearly ten years older than I am. “But don’t take it the wrong way,” he said. I must admit that I was curious as to how many ways he thought I could have taken that assessment. The occasion did give me fresh cause to contemplate old things. It occurred to me that if someone offered me a box of gold coins that had been buried in the ground for 2,000 years, I’m pretty sure I’d take it. I don’t think I’d laugh at him and tell him to come back and see me when he could come up with something new, and in a form that was easier to handle. And I might also confess that if somehow I happened to be offered the original manuscript of the Gospel of John as a free gift, written by the very hand of the Apostle himself, I’d take it. It would never occur to me to say, “Hey, Dude… this is 2014, don’t you have that thing in electronic format? Nobody even deals with paper anymore, much less whatever that fragile looking stuff is, and besides, it’s written in ancient Greek. Nobody even speaks that anymore. I’ll just wait until I can get a newer, updated version.” ‘Old’ isn’t always negative, and sometimes it has nothing to do with meaning, or purpose, or power. Everything about Christmas was already ‘old’ when I first met it. My grandmother, who introduced Christmas and me to each other, was old—well, at least from the perspective of a pre-school aged boy. Not only was Grandma old, so were our all of our Christmas decorations. Most our ornaments, and the little ‘sit-about’ items we placed around the house every December had been around for generations. But for Grandma and me, ‘old’ wasn’t a problem. We didn’t consider any of our Christmas stuff as ‘old’ in the sense that it was no longer significant, or that its role in the family had passed, or that its value had depreciated. Those little ceramic figures, worn from years of handling, the fragile glass ornaments, and those strands of schizophrenic lights may have been old, but they were always faithful. Well… I must admit that the lights were often stricken with an attention seeking disorder that was chronic, but after a little loving manipulation, they always came around. All of these family treasures emerged every December from their sanctified resting place in the back of the hall closet and never failed to work their transformational Christmas magic—just a box of old stuff, but one that rose up to change everything in our little world into something as bright and new as tomorrow’s sunrise. Like Grandma, and like the Christmas story itself, our stuff was old. It was simple and uncomplicated, but when the pieces were placed where they were designed to be, and allowed to do what they were designed to do, their influence changed everything. Old wasn’t a problem, old was powerful. Old was priceless. As the Christmas season approaches, preachers, teachers, speakers, and writers all over the world struggle to find some new slant on a story that’s been around for over 2,000 years. Every syllable of the text is scrutinized afresh, eyes peering at changeless and familiar words, anxiously searching for something not really hidden, but somehow yet unseen. Prayers implore divine help in finding some new insight, some fresh, stimulating new approach. Brains are wracked for some previously unuttered thought that will help the story not seem so ‘old’—as though familiarity has rendered the astounding reality of the event itself somehow insufficient. It’s almost paradoxical. After all, it’s only an account of how the omnipotent God of all creation made His entrance into the world of human beings as one of us. It’s overwhelming. No wonder we obsess over every minor nuance, magnify immaterial details, and proceed to preach lengthy sermons about unverifiable sub-plots. How can we effectively elaborate on the event itself, when the meaning is far more profound than we have the capacity to grasp? It’s frustrating. This familiar and uncomplicated story challenges us. Our best words barely escape the level of insult when compared to the simple ones He provided, yet we cannot stand in its presence and not feel compelled to speak, to write, to sing, to do something. The truth calls us back to the core. So, we turn to the Gospels and wrestle to lay hold of the power of this ‘old’ story every year, and every year we lose, and in the losing, we win. We cannot do it justice, and we cannot let it be. But though it never lets us walk away feeling quite as proud, or standing quite as tall, we never leave it having weakness feel so strong. 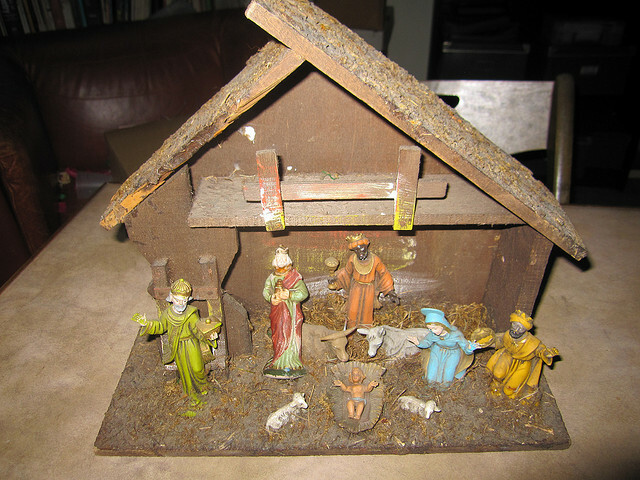 This entry was posted in Christmas, Faith, Family, and Culture, Holidays, Insights, Right Side Up and tagged Christmas story. Bookmark the permalink. 1 Response to Christmas – The Same Old Thing? Like the teachers and pastors, you talk about struggling to find appropriate words to do justice, the same inability to write anything meaningful has struck me just now. So true are the words you have written here, Ron – what an elegantly simple story was written over 2000 years ago, and the impact to us is so simple, yet so complex, as well. Because of HIM…. we shall live. Thanks for the words… good start to the morning. Merry CHRISTmas.